The Committee to Save Cooper Union — What If Cooper’s Annual Rent from the Chrysler Building was Tripled? CSCU is pursuing legal action as a last resort after Cooper Union’s Board of Trustees proceeded to stop offering the free education required by the Charter. What If Cooper’s Annual Rent from the Chrysler Building was Tripled? What if the annual rent from the Chrysler building was $97.5 million? That’s what Tishman Speyer implied the lease was worth in 2006 to The Wall Street Journal. It is likely worth far more today. That’s $97.5 million, without the tax exemption subsidy. That level of rent would give Cooper Union a massive budget surplus. But of course, that wasn’t the deal the Board of Trustees cut with Tishman Speyer. Back in 2006, when the Trustees borrowed $175 million to build the new academic building and invest in hedge funds, they renegotiated the lease for Cooper Union’s key asset, the Chrysler building. The existing lease for the Chrysler Building between landlord (Cooper Union) and tenant (Tishman Speyer) was supposed to expire on January 1, 2018. Under the new lease, negotiated by the Board in 2006, rent payments would go up to $32.5 million in 2018, $41 million in 2028, and $55 million in 2038. The newly renegotiated lease grossly undervalued the Chrysler building. How could that happen? According to The New York Times, “it doesn’t seem the trustees made any serious attempt to even determine its [the Chrysler building’s] market price.” We do know that in 2000, six years before the Board renegotiated the lease, the New York Times reported that Tishman Speyer valued the Chrysler Building as high as $800 million. According to an appraisal done in 2009 (after the renegotiation), the value of the income stream from the new Chrysler Building lease with Tishman Speyer was estimated at $420 million. An oddly low figure, as the Abu Dhabi Investment Council purchased 90% of the Chrysler lease for $800 million in 2008, with Tishman Speyer retaining the rest. So who negotiated this questionable deal with Tishman Speyer? We’re not sure exactly who all was involved given the Board of Trustees’ opaque governance. But some accounts assert that Trustee William Sandholm, who was a key negotiator of the initial Chrysler building lease, was also involved in the 2006 lease renegotiation. His ‘day job’ at the time was the Chief Operating Officer of Rose Associates — which lists Tishman Speyer as a client. Following the 2006 deal, William Sandholm was promoted to Chief Executive Officer of Rose Associates. Again, we don’t know if there was any malfeasance, but there is certainly an appearance of serious conflict here. You may remember that Jonathan Rose, of Rose Associates, was responsible for oversight of the construction of the new trophy building for Cooper Union, while his mother, Sandra Rose sat on the Board of Trustees. Whatever the potential conflict of interest, the building’s cost ballooned from $105 million to $167 million under Rose’s supervision. Yet Mark Epstein, former chairman of the board of trustees for Cooper Union, claimed that the board’s real estate machinations completely paid for the $167 million building and that tuition was necessary because alumni just didn’t give enough. Please donate to our legal action in these last few days of our 2nd Indiegogo campaign and help restore Cooper Union to its 155 year mission of free tuition and ensure trustworthy Trustee and Administration stewardship. We’ve nearly reached our goal, help us go over the top! If you haven’t seen the movie “Ivory Tower,” don’t miss its national broadcast premiere coming up on CNN this Thursday, November 20 at 9:00pm and 11:00pm EST. Cooper Union’s situation is compellingly featured in the movie. New unique alumni-donated artworks have been added as rewards for your contributions! First off, we’re truly excited to be able to offer an opportunity to own this work from a living legend who played an important part in the development of Contemporary Art in America. We thank you Henry, for stepping up in defense of Cooper Union’s founding principles. Here is a photograph of Henry shortly after his 90th birthday. 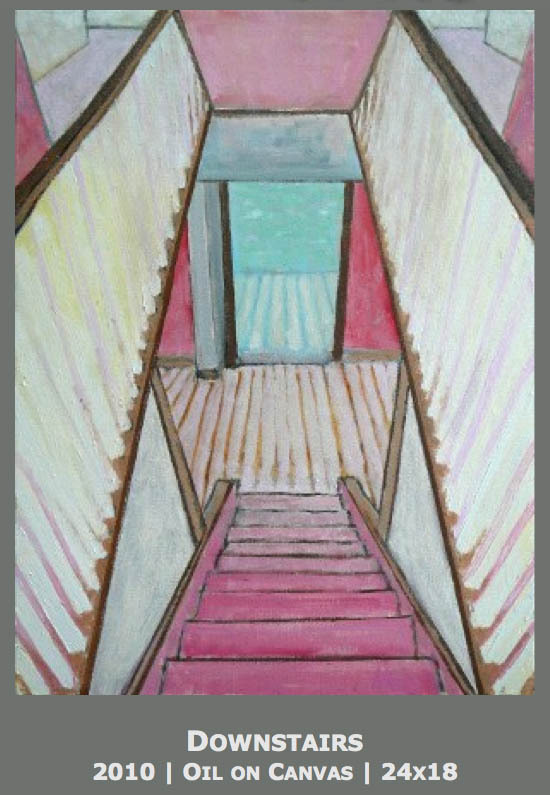 An original oil painting by a true pioneer of contemporary American art, Henry Niese, entitled “Downstairs” 2010, oil on canvas, 24 x 18 inches, available for a contribution of $3500. This is a very fine example of Henry’s fascination with depicting the complexities of interior spaces. He was once called “The Famous Floor Painter” by his fellow artists. Henry started showing in NY galleries while still a student at The Cooper Union in the late ’40s. Soon after graduation, he studied in Paris, and met and spent time with Picasso in his ceramics studio, Atelier Ramier in Juan les Pins. 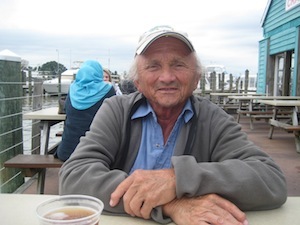 He came of age as a painter working in New York in the 1950’s, where he befriended Franz Kline, Willem de Kooning, and other painters at The Cedar Bar. Together they formed the “Artists’ Club,” which met regularly on Friday nights at Ken Campbell’s sculpture studio on 14th Street, for “discussion and refreshments.“ Henry’s friend, poet William Carlos Williams, wrote a poem about one of his paintings. Henry has exhibited in numerous group shows, including the Annual NY Avant Garde Art Festivals, 1969-1978, four shows at the Whitney, three Corcoran Gallery Biennials, the Museum of Modern Art, NY, the Boston Museum, and others. He has had 27 solo exhibitions since 1956. In the 60’s, Henry taught at Ohio State, and later at the University of Maryland. He has also lectured at Yale University and UC Santa Barbara. Henry Niese is a graduate of The Cooper Union and Columbia University, NYC and holds a Certificate from Academie de la Grande Chaumiere, Paris, 1949. His work is in numerous Museum collections, including the Whitney Museum, The Corcoran Gallery, the NJ State Museum, and the National Museum of American Art (Smithsonian). His work has won numerous awards, including three Silvermine Guild Prizes, a Yaddo Fellowship, the W. A. Clark Prize at the Corcoran Gallery, and a Pulitzer Award in 1954. Henry currently lives in Maryland in a 200 year old stone farmhouse where he spends his time painting, teaching and taking care of his sheep. A framed photographic print of an image entitled “Orchard Street 1980” 20x25 inches, mounted and floated in a white maple frame. This image, from the book “Time and Space on the Lower East Side,” was made by Brian Rose and Edward Fausty in 1980, shortly after they graduated from Cooper Union. Available for a contribution of $1500. Born in Virgina, Brian moved to New York City in 1977 to attend Cooper Union. 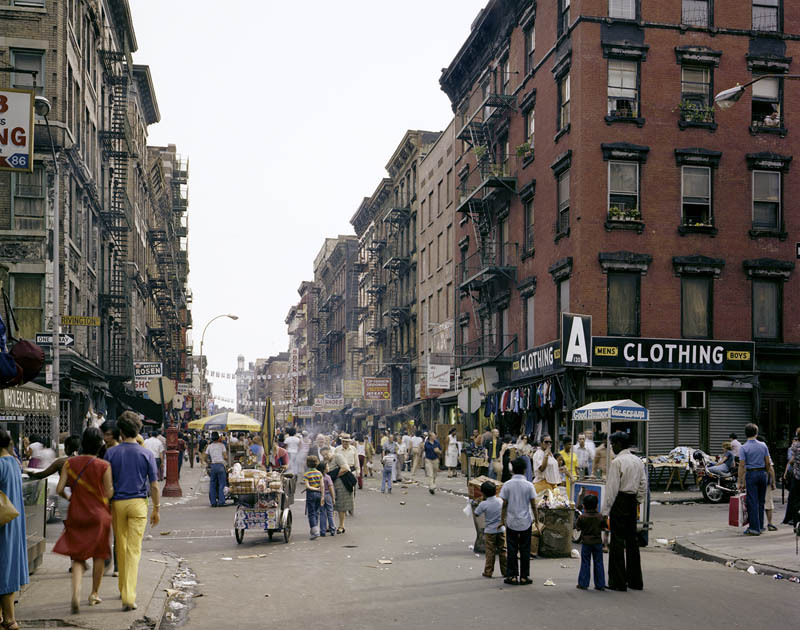 In 1980 he and fellow Cooper graduate Edward Fausty photographed the Lower East Side of Manhattan. In 1985 Rose began photographing the Iron Curtain and Berlin Wall. That work was published in 2004 as The Lost Border, the Landscape of the Iron Curtain. After living in the Netherlands for 14 years, Rose returned to New York and began re-photographing the Lower East Side. That work, which encapsulates 30 years of history, was published as Time and Space on the Lower East Side. A companion project about the Meatpacking District of New York was published in June of 2014. Rose’s photographs have been collected by the Museum of Modern Art and the Metropolitan Museum of Art. He is represented by Dillon Gallery in New York. 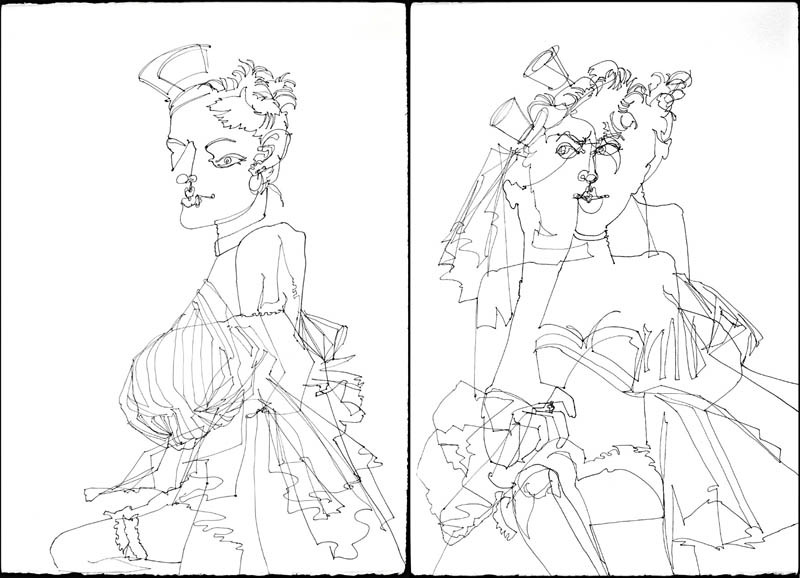 A pair of original, live, blind contour drawings, entitled “La Petite Couquette I & II”, 2010. Each is 15 x 22 inches, ink on arches cotton rag paper. Unframed, available for a contribution of $1500. Noir LeBlanc (Zeborah Houides) Art’92, is a dedicated artist working in Portland, Oregon. She is best known for her unique Skeletal and live figural blind drawing technique. 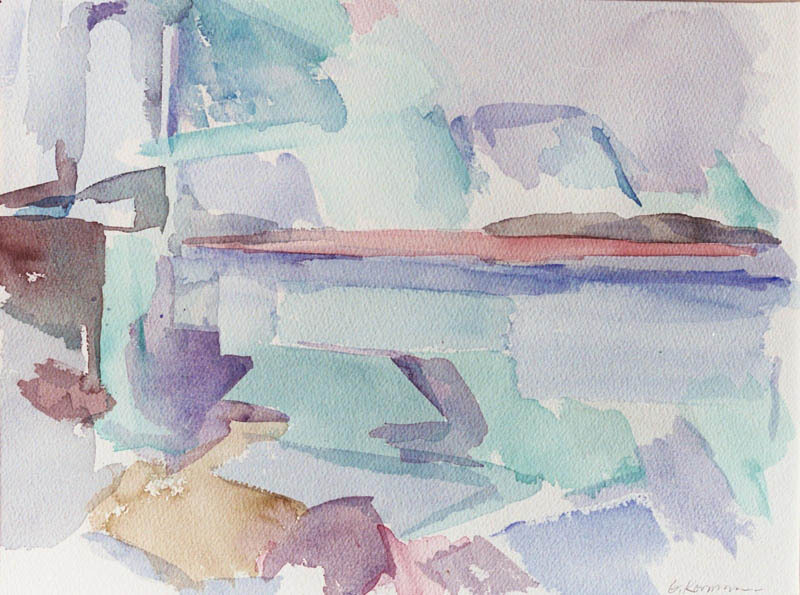 An original watercolor on paper entitled “Whitestone bridge from College Pt.”, 12x16“ unframed (Mounted in mat 16x20“) Available for a contribution of $550. Gerald lived and worked in New York City until 2010. His work has been shown in several group shows in N.Y., as well as galleries at the University of Kentucky, Purdue University, and Wheaton College. Residency at the MacDowell Colony, 1972. He now lives and works in Pittsburgh. 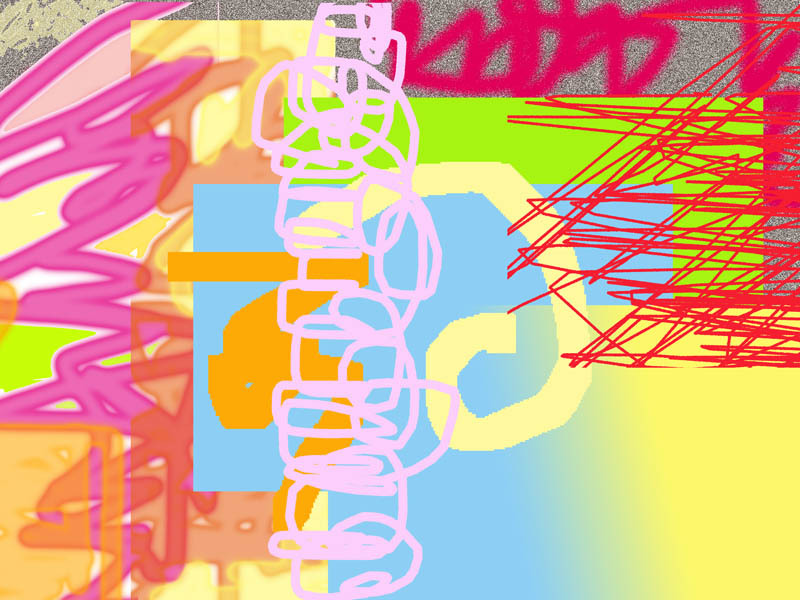 An original digital drawing, inkjet printed on paper, entitled “Art & Industry”, 2001. Inkjet on paper, 18 x 24 inches, signed, numbered and dated. Unframed, available for a contribution of $375. Ellen holds a BFA degree from Cooper Union. She also studied fine arts at NYU, and print making at Pratt, SVA and the Lower East Side Printshop. Her work has been exhibited in numerous museum and gallery shows, including The Cooper-Hewitt Museum, The Lower East Side Print Shop, The Art Students League Gallery, Georgetown University, and a solo show at Gallery 456, NY. She has also designed art books for various publishers, including “Calder Circus” for The Whitney Museum, and was a co-founder of the Asian American Women Artists Alliance (AAWAA, 1997-2008), a non-profit organization with the mission of showcasing the works of Asian women artists. She currently lives and works in Manhattan. To claim any of these new artwork perks, simply visit our Indiegogo page, select the perk and follow the directions. More information on these artworks can be found at the bottom of our Indiegogo page. Mike Essl, Associate Professor of Art, CU ART ’96, M.F.A. Toby Cumberbatch, Professor of Electrical Engineering, Ph.D.